Beloved and I had dinner at Grills & Sizzles a couple of nights ago. This steakhouse is located at Examiner street, a few walks away from Quezon Ave. Beloved and her family frequents this place because, one, it’s pretty close to home and, two, they offer a buffet on weekdays at a pretty affordable price. She also tells me that this place is pretty empty despite the said promo. Despite that, she claims that the steak here is very good. Because Beloved’s family goes here every week, we never really had a good opportunity to go here lest Beloved cares to gain some additional unwanted pounds. Because last week’s storm, they weren’t able to go, and, consequently, we were able to. While the place serves their specialty grilled steaks a la carte, we went here for their Steak and Paella Buffet. 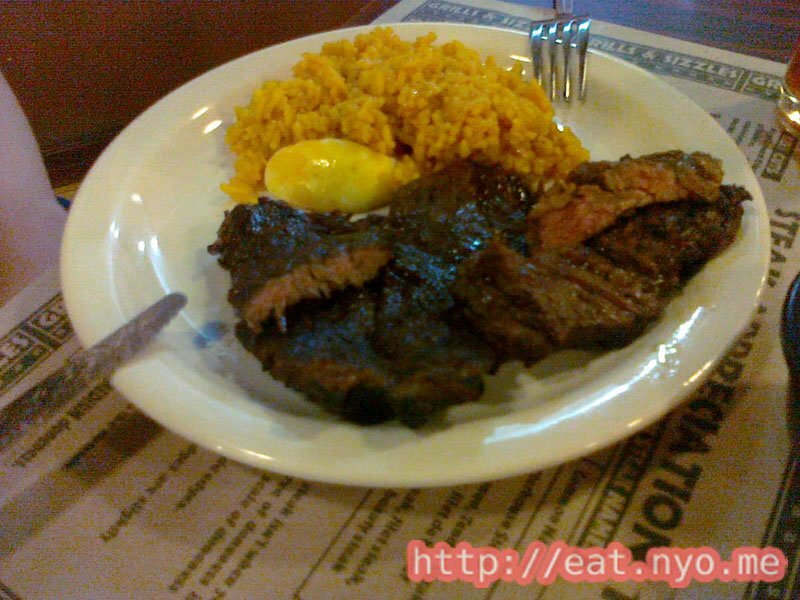 This runs from 6 pm to 10 pm on weekdays at a surprisingly low price of 298 Php, provided you end up with a clean plate. You pay double if you have leftovers, so we kept that in mind as we dove to the buffet table. I’ll start with their steak. Well, there are two available cuts, probably porterhouse or t-bone, using both the tenderloin fillet and the strip steak, without the bone, of course. The larger ones, I believe, were the strip steaks, and the smaller ones the tenderloin fillets. I expected the smaller one to be soft and juicy, which was. What I found surprising was the larger strip part was soft and juicy as well. Both are cooked medium, with just a touch of pink in the center. They also have a distinctly sweet taste, probably from whatever marinade they used. Because it was pretty sweet, I found the gravy (and optional garlic flakes) pretty much required for this meat if you want to eat a lot of it. Their meat receives very high marks from me, probably the softest, juiciest meat I’ve had in the metro. My only complaint is I don’t think the meat is really grilled over coals, for they didn’t have any sear marks nor a crusty outside, and they didn’t have a hint of smokiness. Perhaps they were braised or broiled, which might explain the sweetness and softness of the meat, but I’m just assuming from years of steak eating experience. As for the paella? Well, it’s tasty for rice, but I advise not getting too much of it. It has chorizos and eggs, if you’re interested. It’s not bad at all, but I hope you’re hungry for meat if you want to get the most of this buffet. 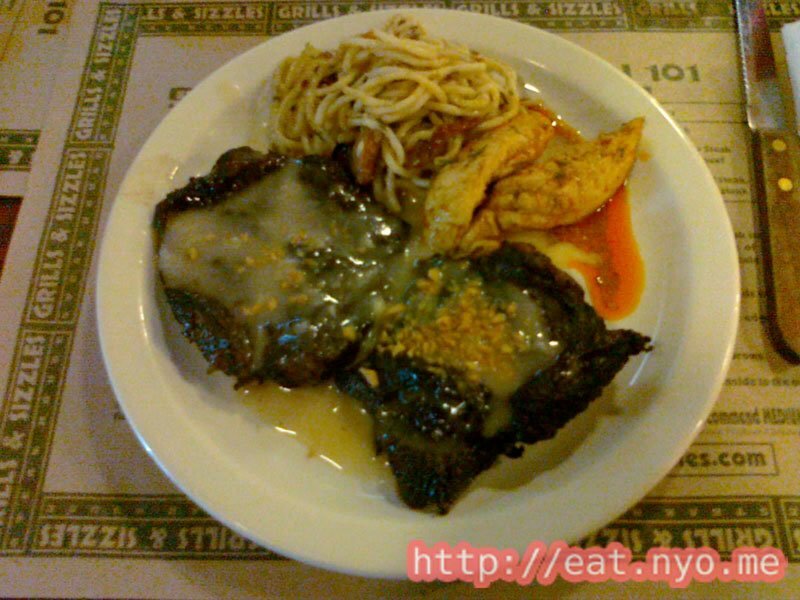 Aside from the steak, Beloved tried out the other two mainstays of the buffet—pasta and another random viand. These two selections vary from day-to-day, and Beloved claims that their Friday seafood pastas are the best. That day, it was some sort of pesto. Similar to the comments I have with their paella, it’s not bad at all. However, it’s not spectacular as well. As for the other random viand, that day’s was pork menudo. I passed on that one. 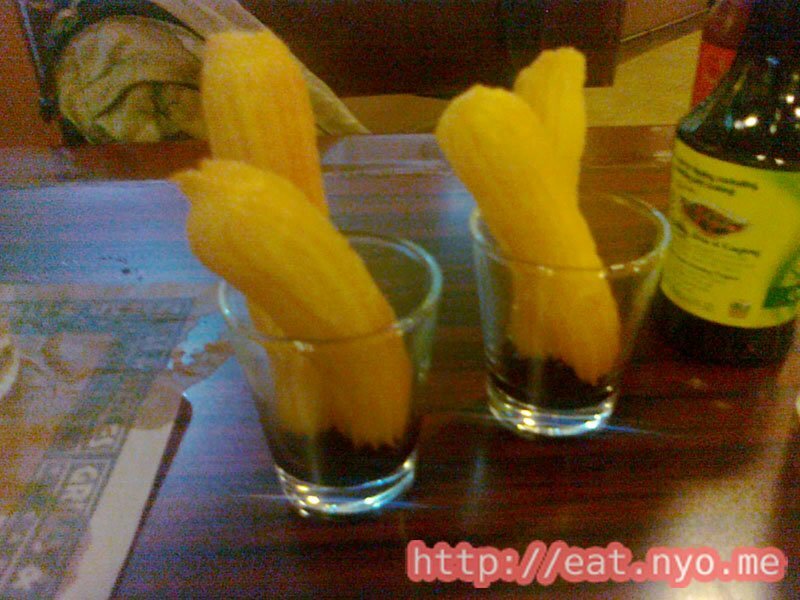 Of course, they also offer appetizers in form of soup and salad, and dessert in form of churros and chocolate cupcake. We tried the soup and churros, the latter being a great punctuation from a meaty dinner. Verdict? Excellent for the price, assuming you have no leftovers. While there are only a few items to choose, the meat alone is worth the tag—and you get to eat a lot of it, assuming you came here for that. Of course, you should come here for that if you’re going here. The rest of the buffet aren’t really much to brag about, except maybe for the churros. However, they are there to serve as great complements to the soft and juicy steaks they have. Of course, this is only excellent value if you leave nothing on your plate, so make sure you’re hungry, hungry for meat, when you go here! Recommended for: Starving weekday carnivores. Smart nomnomnom tip: Preparation is key—empty bowels and not-so-full stomachs will help in this venture.